Maximal resection is the first treatment to propose in DLGG, since allowing a delay of malignant transformation with a significant increase of overall survival. The use of intraoperative mapping enabled a minimization of the postsurgical morbidity while increasing the extent of resection. On the basis of these new concepts of “functional neurooncological surgery,” the future step will be to evolve toward a “preventive neurosurgery” in incidentally discovered DLGG. Indeed, because of the development of noninvasive MRI, one can observe an increased number of incidental DLGG (IDLGG) for unrelated complaints (e.g., headaches, traumatic brain injury) or research studies. In the current literature, the incidence of IDLGG ranges from 0.025 to 0.3 %, and its prevalence is evaluated about 0.05–0.2 % in the healthy population. The natural history of IDLGG was recently analyzed, showing that it was not a benign tumor, but an entity that will grow in all cases (with a growth rate very close to that of symptomatic DLGG), and with a risk of malignant transformation ultimately leading to the death. 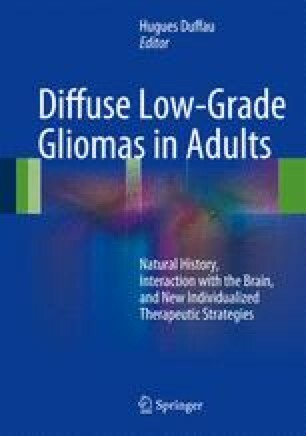 Thus, because IDLGG likely represents an earlier step in the natural course of a glioma than the symptomatic DLGG, their behavior supports the idea that they should be managed as symptomatic DLGG. In this state of mind, several authors proposed to achieve surgical removal of DLGG diagnosed in asymptomatic patients. The rate of total and supratotal resections was improved in comparison with surgical series of symptomatic DLGG, while the rate of permanent deficit was very low, even in critical areas. Interestingly, microfoci with endothelial proliferation were identified in the middle of the tumor in around a quarter of the cases, demonstrating that beginning of malignant transformation may occur before any symptoms. Therefore, these data plead in favor of an early surgical treatment in asymptomatic patients, to maximize the extent of resection before glioma growth and migration, even in eloquent regions. In summary, the similarity of the natural course of DLGG during the silent and symptomatic periods supports “prophylactic” surgical resection of IDLGG.